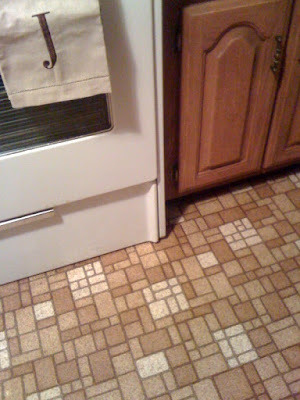 Makin' it in Memphis: Kitchen flooring? It will be a while before we can begin our much anticipated kitchen renovation. We've got to get our contractor back over here to finish project #1 and also need to get our W2s in so we can do our taxes so that we can get our tax credit. My favorite part of this flooring is counting how many people come in and say "this was totally in my grandmother's kitchen when I was growing up." As nostalgic as the floor may be, its seen its better days and there are tears in the floor. We think the floor was probably put in during the '70s when they did an addition to the house, extending the kitchen and adding on our den. Thinking about flooring, I've had some different ideas. We have a galley style kitchen, so long and narrow. When it comes to flooring because of that,we don't have much floor to cover which means it will be a bit less expensive. In our last place, we put in ceramic beige tile that we got for less than a $1 a tile at a home liquidator store (the same one where we got our mattress, actually). That is certainly an option because it looked nice. You can see it in this picture from our old kitchen. And yes, sometimes Tyson eats dog food. It is only fair since sometimes Beamer eats his cat food. While tile is certainly a fine option, it isn't fun... So in exploring some other options, I've been thinking about hardwood flooring for the kitchen. I've read a lot of opinions on forums, especially ones from cooking sites where people actually use their kitchens on a daily basis, and it is about 70/30 as to whether they would recommend hardwood (70 for yes, 30 for no) for your kitchen. We've got oak floors throughout our house and I would love to put them in our kitchen and den when we do the renovation to give it a fluid feel throughout the house. It seems kind of expensive though (Lumber Liquidators is quoting me at 3.49$ a sq ft) for the spice oak, which I think is what we have in our house. By the way, I also really like the pendent lighting above the bar area in that kitchen as well... something I can think about with our planned little bar area. This kitchen picture also brings me to my next post in the future about a decision for the kitchen. We want to save our cabinets because they are in good shape. We'll change out the hardware and I need to decide whether to paint them or put a glossy stain on them. I've been leaning towards painting lately because I love the country look of a cream cabinet but this kitchen makes me want to stain them. Another post for another day. i grew up in a hardwood kitchen and it was great! i think if you clean it regularly, get up spills right away, and put pet food/water on placemats, it should stay in good shape just as long as other rooms' flooring does. I would comment on people's more but my issue is that I read blogs in google reader so if I want to comment on something, I have to click on the actual blog post to get to the comments section. And sometimes I'm too lazy to do that..
Plus you've always got good info or encouragement to share. Love it! I used to have a tile kitchen floor but recently changed it to hardwood and it is so much better. The floor was installed by CrownFlooringUs and they did an amazing job. I recommend contacting them for Irvine, California hardwood flooring.